Back in 2006, Arash Farboud was snubbed by Ferrari when he requested a shiny new Enzo. Apparently they didn't feel the inherited fortune made in pharmaceuticals was enough to make him Ferrari material. 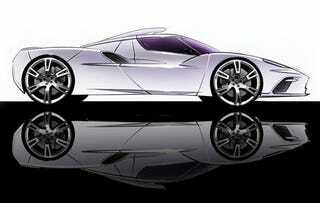 Undaunted, Arash decided to pull a Deuce-move and thumbed his nose at Ferrari, building his own supercar. He pulled together the Farbio GTS as a proof of concept, and for the British Motor Show unveiled a concept car called the Arash AF10, a carbon fiber, Corvette-powered Enzo killer. Since then, things have been quiet, but according to Car, that doesn't mean nothing's been happening.